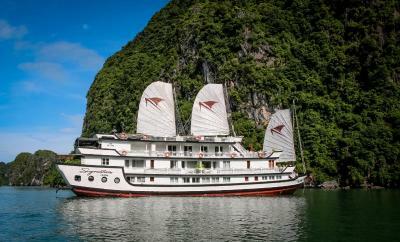 Lock in a great price for Signature Halong Cruise – rated 9.3 by recent guests! Staff were very friendly and cruise manager Cuong did a good job in accommodating to everyone’s needs. Kayaking and squid fishing were lots of fun! Rooms were nice and cozy. Dinner was lovely and intimate. The staff, the organization of the cruise, the activities, the guides Vinh and Nancy were smart and funny. The rooms are spotlessly clean, hard to believe, looks like the ship is brand new. We had two of the best rooms it was a luxurious experience. Would recommend it to everyone! We wish we had stayed two nights! The stuff is outstanding and very caring. Our room is great. Everything is wonderful. Very nice large rooms. Staff were prompt and polite. We had a fabulous 3 days on our boat Signature Cruise 1. Sarah and the staff were all friendly and helpful at all times. The senior suite is definitely worth the extra money as you get a balcony. Highly recommended. The beds were very comfortable. The food was amazing, and the service was fantastic. A special mention to Huog the cruise manager who sorted out everything for us including a cake and small gift for our son’s birthday. Everything was clean and fresh, the food was absolutely amazing and the staff were even better. Could not fault the trip. Happy hour are good. Staff are friendly all times. Signature Halong Cruise This rating is a reflection of how the property compares to the industry standard when it comes to price, facilities and services available. It's based on a self-evaluation by the property. Use this rating to help choose your stay! 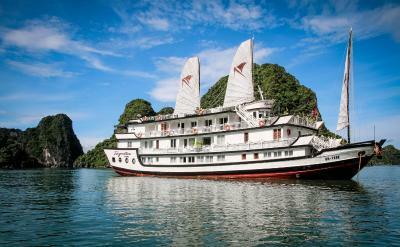 One of our top picks in Ha Long.Housed in a traditional wooden boat, Signature Halong Cruise offers luxurious suites with stunning views of Ha Long Bay, a UNESCO World Heritage Site and Lan Ha Bay. It has a rooftop sun terrace and provides free Tai Chi lesson on board. Featuring French-inspired décor, air-conditioned suites come with parquet flooring, a wardrobe, seating area and a flat-screen TV with cable channels. A safe and mini-bar are also included. The private bathroom is equipped with a bathtub, hairdryer, slippers and free toiletries. 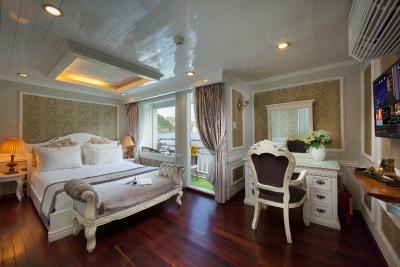 Signature Halong Cruise operates a 24-hour front desk that can assist guests with luggage storage. During the journey along Ha Long Bay, guests can enjoy various activities such as fishing, snorkeling and kayaking at a surcharge. Massage treatments can also be arranged on request. Signature Halong Cruise takes about 4 hours to reach Cat Ba Island. Cat Bi International Airport is 50 mi away, while Noi Bai International Airport is approximately 106 mi away. 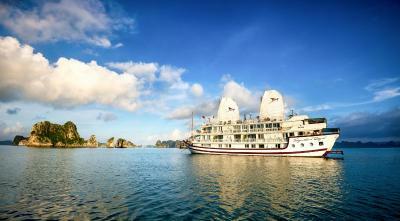 When would you like to stay at Signature Halong Cruise? Located on the first floor, this suite offers sea views. Air-conditioned suites come with parquet flooring, a wardrobe, seating area and a flat-screen TV with cable channels. A safe and mini-bar are also included. The private bathroom is equipped with a spa tub, hairdryer, slippers and free toiletries. Featuring a balcony with sea views, these larger air-conditioned suites on the second floor come with parquet flooring, a wardrobe, seating area and a flat-screen cable TV. A safe and mini-bar are also included. The private bathroom is equipped with a spa tub, hairdryer, slippers and free toiletries. Offering sea views, interconnecting air-conditioned rooms come with parquet flooring, a wardrobe, seating area and a flat-screen TV with cable channels. A safe and mini-bar are also included. The private bathroom is equipped with a bathtub, hairdryer, slippers and free toiletries. Located on the first floor of the cruise, this suite offers sea views. Air-conditioned suites come with parquet flooring, a wardrobe, seating area and a flat-screen TV with cable channels. A safe and mini-bar are also included. The private bathroom is equipped with a spa tub, hairdryer, slippers and free toiletries. Offering sea views from its private terrace, interconnecting air-conditioned rooms come with parquet flooring, a wardrobe, seating area and a flat-screen TV with cable channels. A safe and mini-bar are also included. The private bathroom is equipped with a spa tub, hairdryer, slippers and free toiletries. This suite features a private terrace at the top head of the cruise. It features a panoramic sea view from the top deck The bathroom comes fitted with a spa tub. This suite features a private terrace located on the front of the cruise, offering undisturbed views of the sea from the cabin. The bathroom comes fitted with a spa tub. 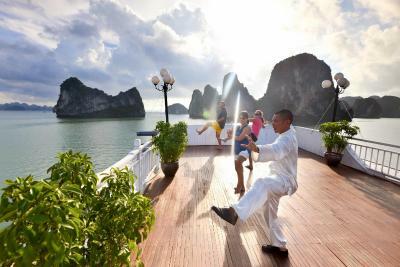 House Rules Signature Halong Cruise takes special requests – add in the next step! 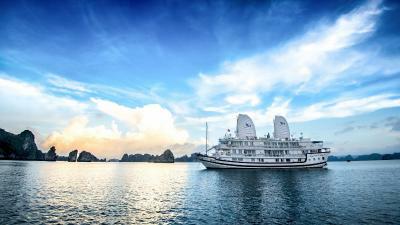 Signature Halong Cruise accepts these cards and reserves the right to temporarily hold an amount prior to arrival. Please note that Cruise itineraries and schedule are subject to change due to weather, tide levels, governmental regulations and daily operations. A 40% prepayment is required for bookings of 5 rooms or more to secure your reservation. The property will contact you for further payment details/instructions. Transfer services are available to and from the property at an extra charge. Please contact the property using the Special Requests box when booking, or contact the property directly with the contact details provided in your confirmation for further information. Guests are expected to contact the property at least 2 days prior to arrival. Advanced registration is compulsory by law. Please provide (using Special Requests) during booking all passport information (full name, gender, date of birth, nationality, passport number, Vietnam visa expiry date (if applicable) at least 24 hours before departure. The Cruise reserves right to cancel bookings of guests who are not showing up at port and present passport information before 12:00 noon on arrival date. Room rates include 2 complimentary bottle of water per cabin daily. Other drinks or beverages will be charged according to the menu. Please note that full settlement of the total reservation is required at least 1 day before departure at the cruise office in cash or credit card (Visa or Master Card only) or via bank transfer. The property will contact you to provide payment instructions. Please inform Signature Halong Cruise of your expected arrival time in advance. You can use the Special Requests box when booking, or contact the property directly using the contact details in your confirmation. Too many boats at the same location. The cruise company mixed up our bookings and one employ was trying to hard sell us the other option(Signature Royal), but having already rejected the other options at the time of booking we didn't budge. In comes Mr Vinh the Tour Manager for 'Signature Halong' Cruise(the one we had booked). He not just ensured that we got on the right cruise, but he even gave us the best room on the cruise( Suite A1). No words to describe his positiveness and genuine efforts in making his guests happy and looked after well. Thanks Vinh for making it a memorable cruise trip around Bai Tu Long Bay and Ha Long Bay. Even the service staff of Huong, Hua, Cuoung, Hiep , Tai(took their names to show our appreciation) and many more whom we might have interacted with tried their level best to serve all guests with a smile. 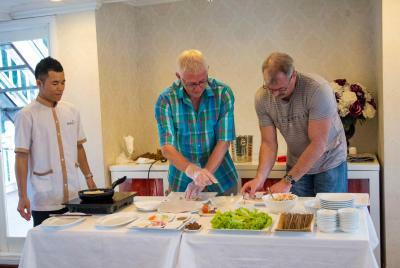 The food was excellent and all needs and dietary conditions were met with a smile. A big thank you to Vinh and team..... A truly memorable holiday onboard their cruise '👍Signature Halong' !!!!!! Interior of the ship is at least 20 years old. With a little wind, the ramshackle windows will keep you up all night. Overall, I thought the price was quite high for what was given. The tours were minimal and there was a feeling of being rushed through the day. The staff, while fantastic were pushy with buying drinks and leaving reviews, even hovering over guests for formal feedback in front of everyone. The organization of the transfers was bad and we spend in total 3 hours waiting to board the cruise/ going back to Hanoi. They also lost one of our luggages and they didn’t even try to find it when we first approached them. Nothing! Wish we had more time. One small thing was on the way we were starving on the 3hour bus journey but instead of dropping up at a cafe/restaurant we stopped at a pearl farm with no dining options. Felt this was a bit pushy to make purchases. Amazing staff who couldn't do more to help. Lovely rooms and really close to the town centre. The long wait for the taxi to return back to Hanoi. However that was out of anyone's control. All of it was Wonderful. Vign, the host was excellent. He couldn't be faulted for his thoroughness in making it a special stay. We loved going on the kayaks, free to paddle at ones leisure. Also the first early morning Tai Chi. Despite there being Wi-Fi advertised there was no Wi-Fi on board which is to be expect given that you are on board a boat with no near villages/city. Apart from this small fault I think that everything was great. We started our experience with arranged transfers the company from our hotel in hanoi which I consider was worth it. The transfer was air conditioned, had Wi-Fi, 2 usb points to charge items at each seat and leather seats. There was breaks along the journey, one where you visited a pearl farm. When we arrived at ha long, we were greeted by chin who was our guide for the time we were on the boat. We handed our luggage over and then had a welcome drink. Then we boarded the boat and had a welcome talk before being given our room key. The room was gorgeous with everything we needed and had a great balcony. I will never forget such a beautiful view. We enjoyed all the food on board and the drinks were good. The activities were well organised and were enjoyable. I could not thank the staff enough for an enjoyable experience and especially chin who worked hard to answer any questions. Great trip on this boat, staff were very friendly and the whole thing was well organised. The food was excellent and plenty of it, 5 course lunch and dinners! Vinh the cruise manager was superb and made a great trip excellent. Fabulous cabin and great food. We've found hotel staff to be really helpful and friendly throughout Vietnam, but the guys here were a step above the rest, especially Bruce, Liam and Tina. Junk was very luxurious and well maintained. Bruce Liam Tony and Tina were are great.